Most of us are familiar with the need for our teens to become more independent, better communicators, and to develop good decision making skills. A quick scan of the news headlines can really make one wonder about the future of our community, country, and world. This post will help relieve your anxieties! One of the ways that the Florida 4-H Program is successfully addressing this need is through our summer camp counselor program. 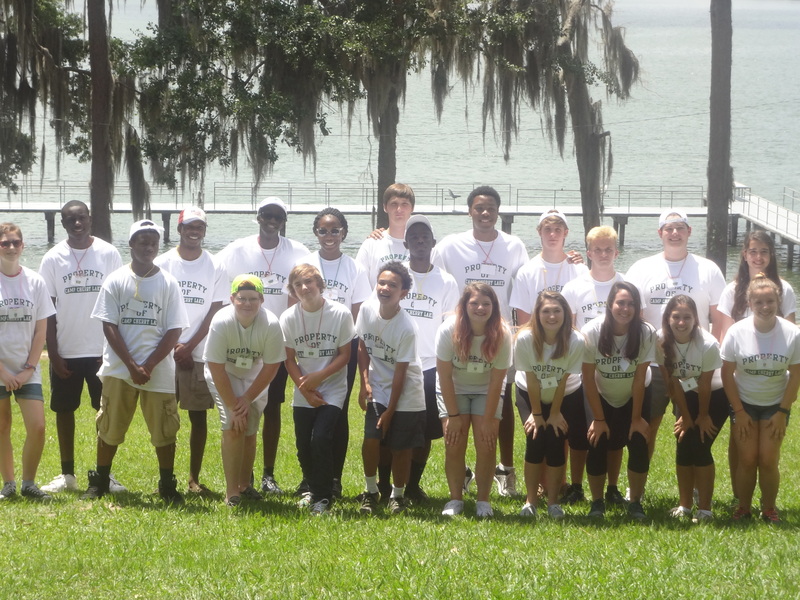 4-H Camp Counselors have the opportunity to learn valuable leadership skills while at the same time have a positive effect on the lives of many children. Counselors wear many hats during camp, sometimes serving in the role of a parent, role model, confidant, counselor, nurse, and mediator all in one day. The task of sharing the impact teen volunteers make as counselors was not very difficult since this is a role I have personally seen materialize while working as an 4-H extension educator. There is nothing more rewarding then to watch a child grow up starting out as a home sick camper, then developing into a confidence camper, and later becoming a responsible and dependable teen camp counselor. A recent study in Wisconsin measuring the impact of being a camp counselor resulted in the following: Teens were asked “What is unique about being a counselor?” and “What skills have you develop as a result of serving as a counselor”? The top eight skills identified included (in order of ranking) leadership, people skills, communication, patience, responsibility, teamwork, problem solving, and planning. They also reported that this experience will help them prepare for their careers because of the skills they have learned (Forsythe, Matysik, and Nelson). Research has clearly shown that the camp counselor experience provides an excellent opportunity for teens to gain leadership skills that are proven to build much needed life skills that will help them later in life. 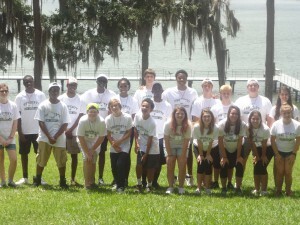 To find out more about 4-H teen leadership programs, contact your local UF IFAS Extension Office. If you have skills or experiences to share with teens to help prepare them for a future career, consider becoming a 4-H Volunteer. We offer a variety of volunteer roles based on your interests and schedule. We hope you have enjoyed this month’s series on 4-H Summer Camp. Next week, a new series on summer safety will begin as Yolanda Goode shares firework safety tips! Your opinion matters to us- please take this short survey to provide feedback to help us improve this blog https://ufl.qualtrics.com/SE/?SID=SV_3gtLKjqia3F75QN. Camp would not be possible without volunteer Terre Arnold. From scrapes and sunburns to headaches and homesickness, Terre Arnold is filling a critical role at 4-H Camp Timpoochee by keeping campers safe and healthy. 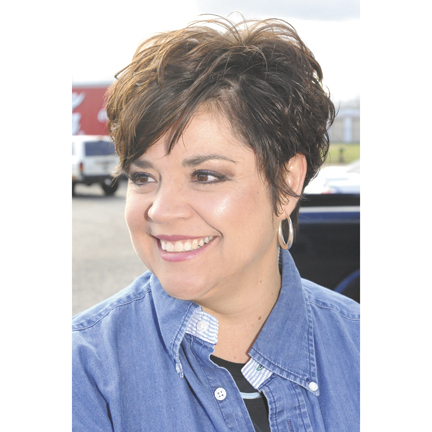 During the school year, Terre works as a school health aid and a bus driver so she is a natural fit to serve as the 4-H Camp Timpoochee nurse. Terre has served as camp nurse for the Holmes/Washington/Okaloosa Counties week of 4-H residential camp for the past five years. With her warm smile, infectious laugh, caring heart and love of fun, Terre easily soothes what ails the campers, makes them comfortable and sends them on their way to have fun. Terre describes her camping experience as a joy from year to year. With each year bringing new experiences, she loves meeting new campers and seeing returning campers grow from year to year. From the youngest camper to veteran counselors, Terre has a way with kids that makes the overall camp experience better for them. She’s also a great camp recruiter and never misses a chance to tell young kids what a great experience 4-H Camp is and how exciting and fun the week will be. The 4-H camping program depends on volunteers like Terre. Every county is required to have a camp nurse during their week at 4-H Camp Timpoochee or Camp Cherry Lake. Typical responsibilities include curing occasional homesickness or tummy aches, or administering any prescription medications that campers may need during the week. If you have an interest in serving as a camp nurse and would like to volunteer for your local 4-H program, contact your UF IFAS County Extension Office or visit http://florida4h.org/volunteers. School is out and the summer is quickly approaching. As a kid, this was my favorite time of the year because in a few weeks I would be off to summer camp. I was always excited about summer camp because it was a time to make new friends while participating in my favorite outdoor activities. Going to sleep away camp gave me a sense of independence and allowed me to learn and make decisions on my own. What classes did I want to take? What activities did I want to participate in? This was something I had to decide on my own without my parents input. 4-H summer camp is the perfect opportunity to learn, make friends, disconnect from electronics, and enjoy the outdoors! Camp Cherry Lake and Camp Timpoochee give youth the opportunity to learn while having fun in a safe environment. Have a sleepover at a relative’s house for the weekend. When physically packing, make sure your camper is involved. This can help prevent homesickness as well as making them aware of what they have with them. When packing for camp, make a list so that nothing is forgotten. Try avoid making deals with your child (If you are homesick, I will come pick you up early). The American Camping Association has some great online reources for preventing homesickness. For more information about 4-H summer camp opportunities for youth and teen and adult volunteers, contact your local UF IFAS Extension Office. Your opinion matters! Please provide feedback on this short survey to help us improve our blog:https://ufl.qualtrics.com/SE/?SID=SV_3gtLKjqia3F75QN. 4-H Summer in the Panhandle: Learning and Fun! 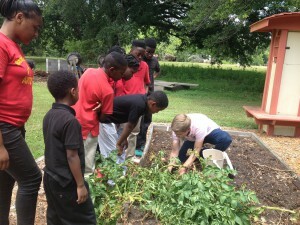 Youth learn how to grow and prepare vegetables during a gardening day camp in Escambia County. Each summer, 4-H programs across the Florida panhandle offer a wide array of residential and day camps for youth ages 5-18. Summer residential and day camps are a great way for youth to be introduced to all that 4-H has to offer. Many camps explore specific 4-H projects, or topics, such as culinary arts, sewing, livestock or robotics, while others offer a smorgasbord of 4-H activities. These camps differ from typical summer programs in that they are framed around the essential elements of positive youth development. 4-H is focused on developing life skills through educational programs that promote competence, confidence, connection, character, and compassion. The connection of 4-H to land grant universities like the University of Florida also means that camp curriculum is based on the best knowledge available about any given project, and taught by caring adults using learn-by-doing methods. This summer youth are in no shortage of camps to satisfy their desire to learn while having fun. Below you can find a list of day camps that will be offered throughout the panhandle. Hurry and register your youth for the time of their life, spaces often fill quickly. Most counties also offer week long overnight camps at Camp Timpoochee or Camp Cherry Lake. Contact the 4-H agent near you for more information and to register for any of these camps. Click on the county links below for more information. Register now and let the fun begin! June 2 – Garden to Plate Day Camp – $5, 8am-2pm (age 9-16) – Get in the kitchen with Chef David Bearl as he leads us in an interactive learning experience about cooking and activities that promote healthy lifestyles and Florida agriculture as they discuss gardening techniques and food safety. June 17-19 – Dairy Day Camp – $5, 8am-2pm each day – Join us for three days of exploring the world of dairy. From care and biology to how to use the products of dairy cows, this camp will introduce you to the dairy industry while you make new friends and enjoy dairy related activities. June 29 – Water Conservation Day Camp- $5, 8am-2pm – join Master Gardeners and Extension faculty in an exploration of the importance of water to our planet, how nature works to conserve it, and how we can do our part (prepare to get wet!). July 15 – Community Awareness and Service Day Camp – $5, 8am-2pm –We will take trash items like plastic bags and jugs that you collect and reuse them to make useful items for people in need. 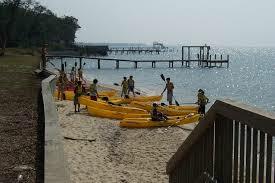 This camp will focus on overuse and its environmental and social consequences. July 21 – Search and Rescue Day Camp – $5, 8am – 2pm – Klaas Kids will join us for a day camp of fun and safety training. Youth will learn the process of search and rescue including how K9 units track and find lost children, and strategies youth can use for preventing crimes against them as well as what to do if they are lost in various settings. June 8 – 12 Clothing Adventures – $70, 8-5 – Youth will discover the science & technology behind fabrics, fabric care, fabric construction, and create projects. June 15-19 Quirky Culinary Capers – $70, 8-5 – Youth will explore the magic of food science, prepare nutritious snacks, and learn how to improve their health for optimum living. July 20-24 – It’s Alive: Junk Drawer Robotics – $70, 8-5 – Youth will engage in robotic design, use, construction, and control as they work in teams to make it come alive with everyday items. Wednesday, July 22 is challenged day in Tallahassee. July 20-22 – Junk Drawer Robotics – $80, 9:00 – 5:00 – learn how to make robots out of everyday household products. On the last day of camp there will be a Robotics contest with surrounding counties and will be held at the North Florida Fairground. June 22-26 – 4-H Wildlife camp – $80, 8-5 (age 10-18) – This outdoor nature camp will provide its participants with a basic understanding of environmental stewardship, wildlife, safety, and fun in an outdoor setting. Fun educational sessions covering National STEM (science, technology, engineering and math) initiatives will be taught by qualified instructors in aquatics, forestry, conservation, shooting sports, and orienteering. June 30-July 2 – 4-H Outdoor cooking Camp – $80, 9-4 (age 9-13) – Youth will learn the safety and art of cooking over fire, and will go on a farm field trip. July 13-17 – 4-H Previous Attendees Sewing Camp – $35, 8:30-12 (age 8-18) – This sewing camp is for previous 4-H sewing camp attendees or those with sewing experience. Refer to flier for required materials needed for camp. June 15-19 – 4-H Cooking Camp (age 8-12)- $100, 7:30-2 – Youth will learn to cook a variety of dishes and bring home a few yummy dishes! Baking, measuring, safety tips, food planning, grocery shopping, reading labels, frying, nutritional education, grilling, canning, bread-making and more will be on the agenda. June 22-26 – Discovering 4-H Day Camp – $100, 7:30-4 – These days will expose youth all the projects Santa Rosa County 4-H has to offer. Monday: Trip to Bear Lake for wildlife and natural resources hike. Tuesday: Farm tour. Wednesday: Navarre Marine Ecology and Butterfly house. Thursday: Archery and garden tour. Friday: Nutrition, peanuts, beekeeping. June 15-17 – 4-H Sewing and Crafts Camp – $35, 8:30-4:30 – “learning sewing and artistic crafts, one stich at a time.” The camp will focus on basic sewing and crafting skills. June 24-26 – 4-H Cooking Day Camp – $35, 8:30-4:30 – “a chef in the garden, a scientist in the kitchen.” The campers will learn how to cook simple, healthy, meals, while exploring where food comes from, and how, scientifically, it can be transformed into delicious meals through cooking.